US equity indexes saw continued weakness, with net weekly changes ranging from -1.1% (Nasdaq Comp'), -0.6% (Dow), to +1.2% (R2K). 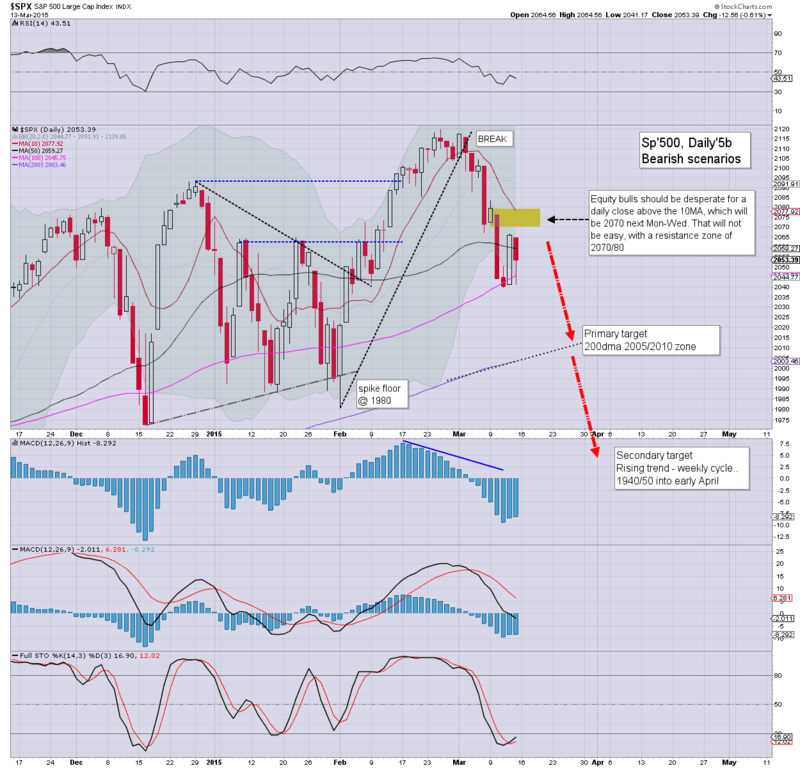 Near term outlook offers a bounce to the sp'2070s, before downside to at least sp'2010/00. 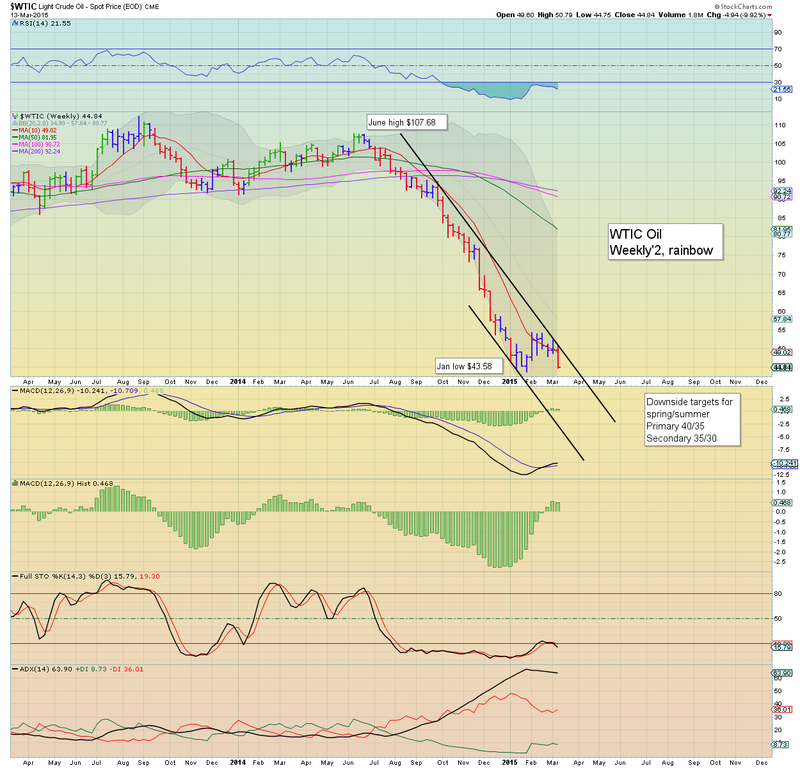 If Oil loses $43, and the USD continues to strengthen, there is threat of the 1950/25 zone by end month. 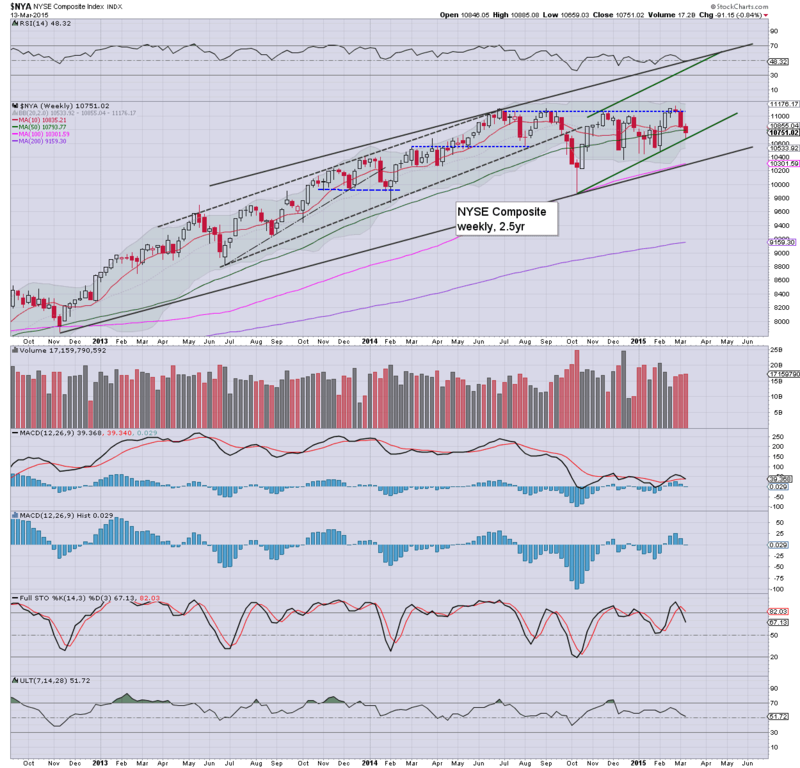 The sp'500 saw a borderline significant weekly decline of -17pts (-0.9%), settling at 2053.. with a Wed' low of 2039. Most notable, this was the third consecutive net weekly decline. The last time the market saw four consecutive down weeks was the major washout last October. Underlying MACD (blue bar histogram) cycle has turned negative, with a bearish cross. 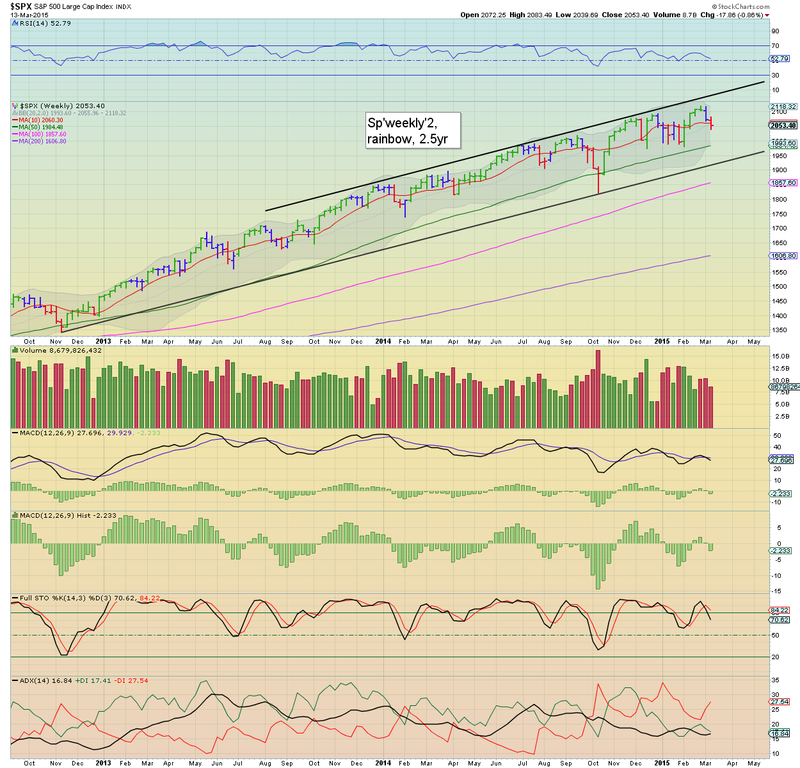 There looks to be easy downside to the sp'2k threshold.. where there are multiple aspects of support. Any break of the 2k threshold will open up a swift and stronger drop to the 1950/25 zone before end March. The Oct' low of 1820 looks VERY much out of range.. even if the USD keeps rising, along with Oil losing the Jan' low of $43. The tech' declined -1.1%... with the 5k threshold fading away above. There is near term downside to the 4600/500 zone. A break <4400 appears out of range in the current multi-week down cycle. The mighty Dow fell a moderate -0.6% this week in the 17700s. 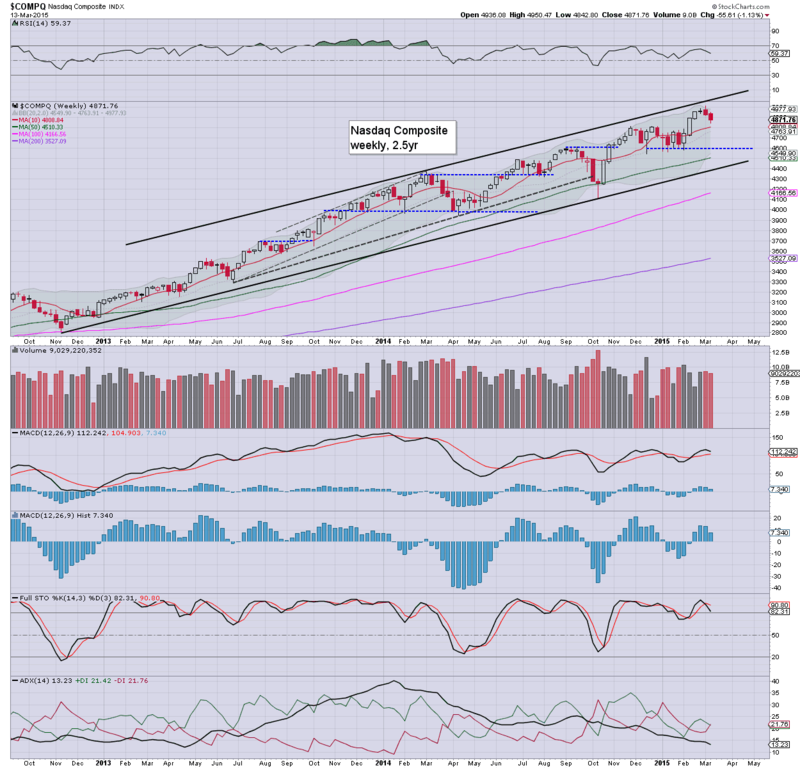 There is near term downside to the 17200s... best case for the bears looks to be around 16750.. around 5% lower. The master index cooled by -0.8% this week. 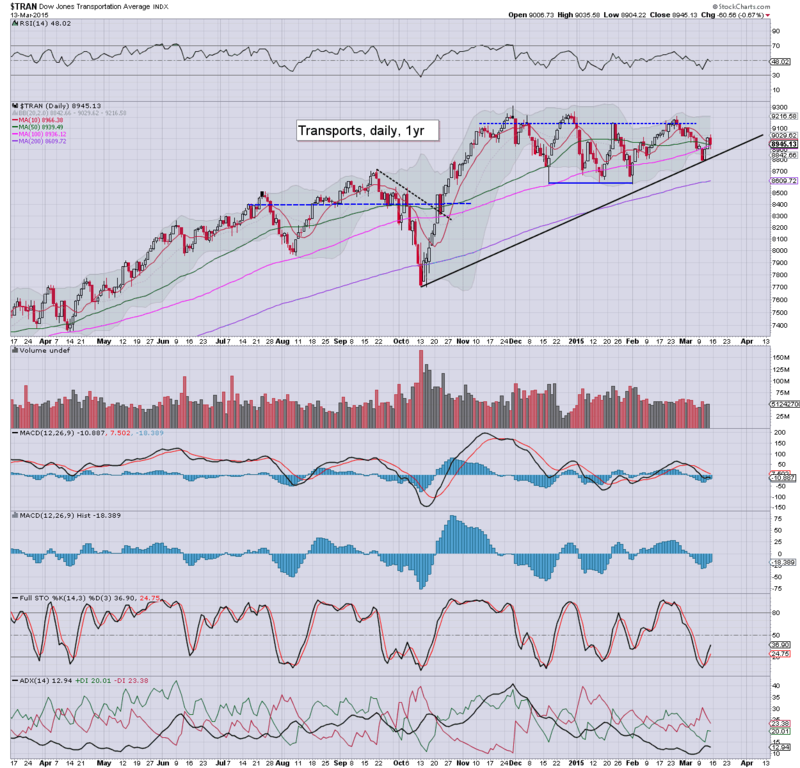 Rising trend is set to fail... with viable downside to the 10300s, which is around 4.5% lower. The second market leader saw a notable net weekly gain of 1.2%. Equity bears need to take out the key 1200 threshold, which will open up downside to the 1150s.. where there is very strong support. The 'old leader' climbed a moderate 0.4% this week. If the main market resumes lower... losing the sp'2k threshold, then the Trans looks set to slip to the 8400/300s by end March. 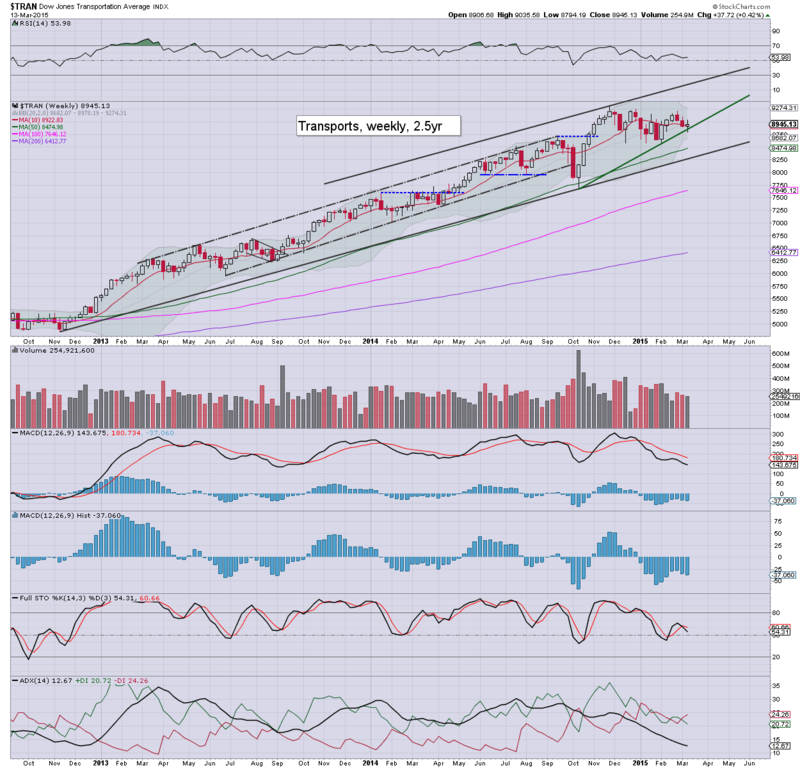 First, it is notable that the two leaders (as I like to call them) - Trans/R2K, both managed net weekly gains. Yet... taken as a collective, it was certainly not a bullish week for US equities. 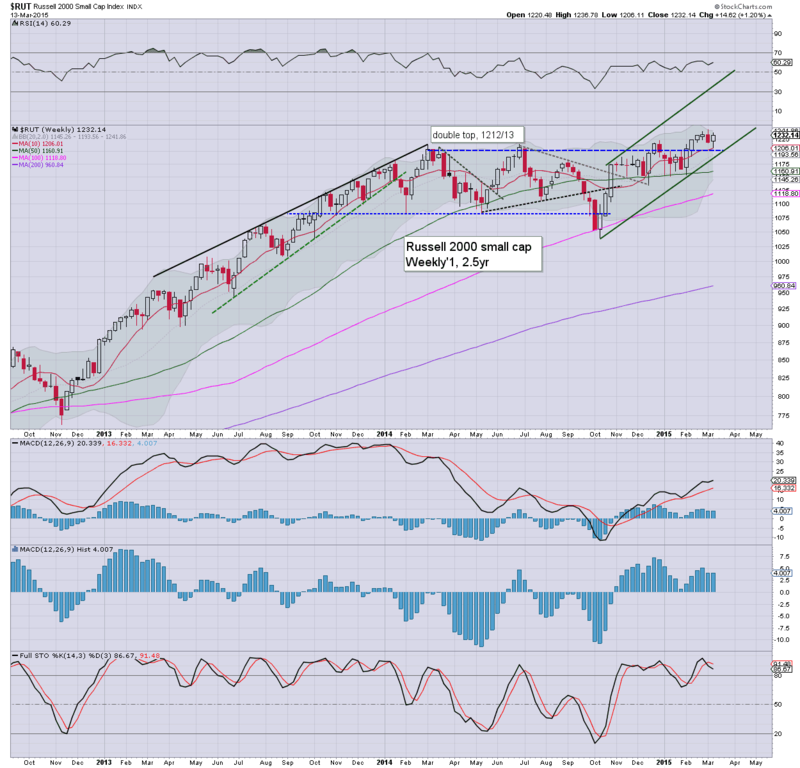 If the sp'500 loses the 2k threshold - where the 200dma is lurking, it will bode for another wave lower into end month. Unlike October - where the market had two full weeks to rebound for a net monthly gain... this time around, the market could settle near the lows... somewhere in the mid 1900s. Arguably, even a move into the 1900s will not offer clarity of a much grander down wave this spring/summer. 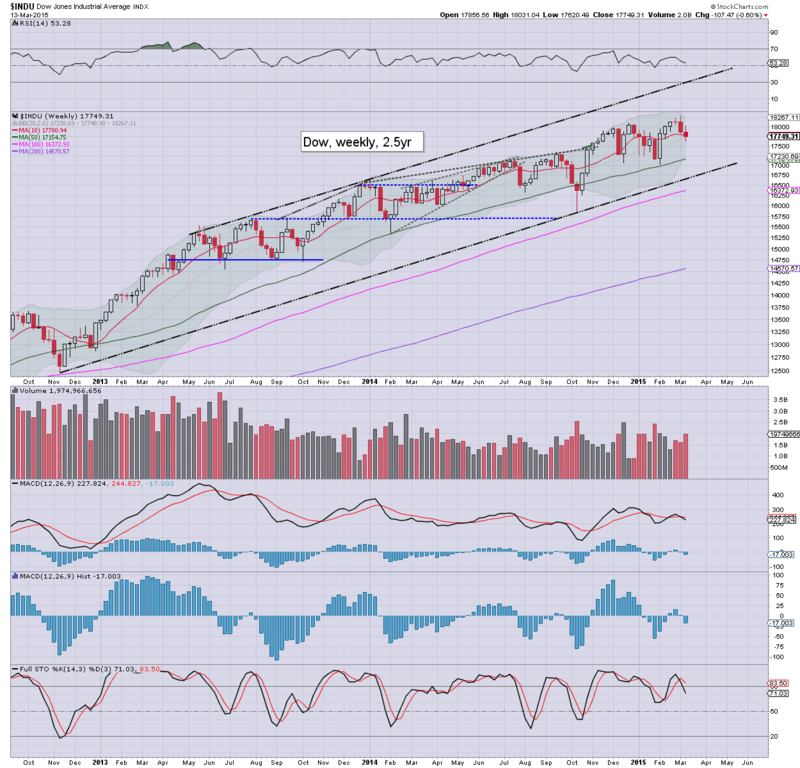 The Oct' low of 1820 is a clear 11% lower, and I see very few calling for that degree of decline. My best guess? Continued USD strength, Oil loses $43, and market falls into the mid/low 1900s.. before rebounding VERY strongly on Q1 earnings in April. From there, the critical issue will be whether the next multi-week up wave puts in a lower high... or just keeps on climbing into early summer. *FOMC announcement, due 2pm. Chair Yellen is set to do a press conf' shortly after.. and that will likely last until around 3.30pm. Market will be expecting no change in rates, and will be particularly focused on the usual fed word games. Will the Fed remove the word 'patience'? If they don't, it could be perceived as weakness, but if they do, it might give the market a stark reminder that rates are likely to rise at the June FOMC. In many ways, we have a possible lose-lose scenario on the menu. **At the Wednesday close, the Dow will be changed. AAPL will be added... replacing T.
With a major failure to see continued upside from the Wed' low of 2039, equities closed the week on a negative note. 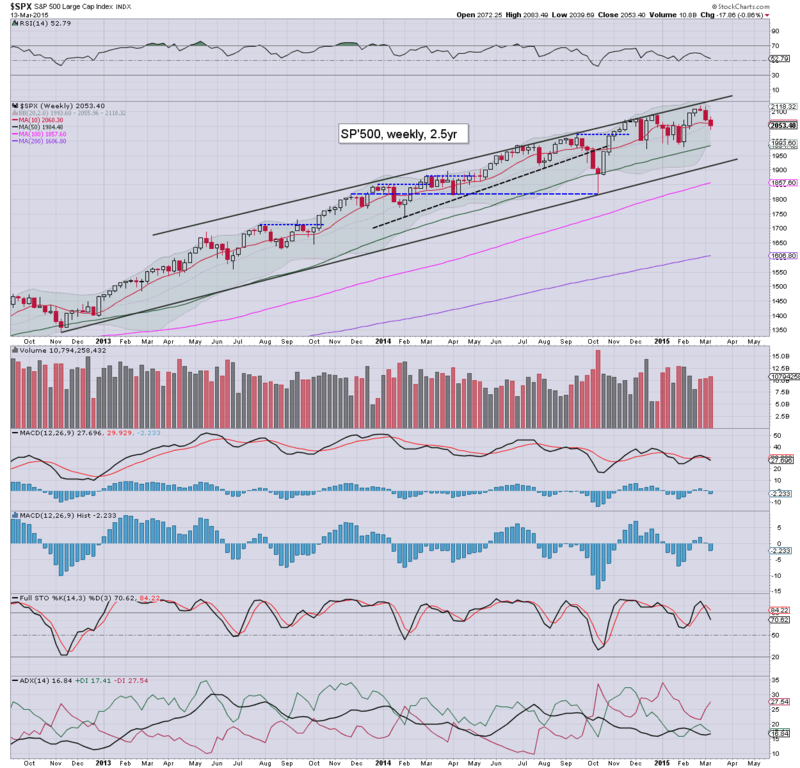 The sp'500 saw the third consecutive net weekly decline of -17pts (-0.9%) @ 2053. 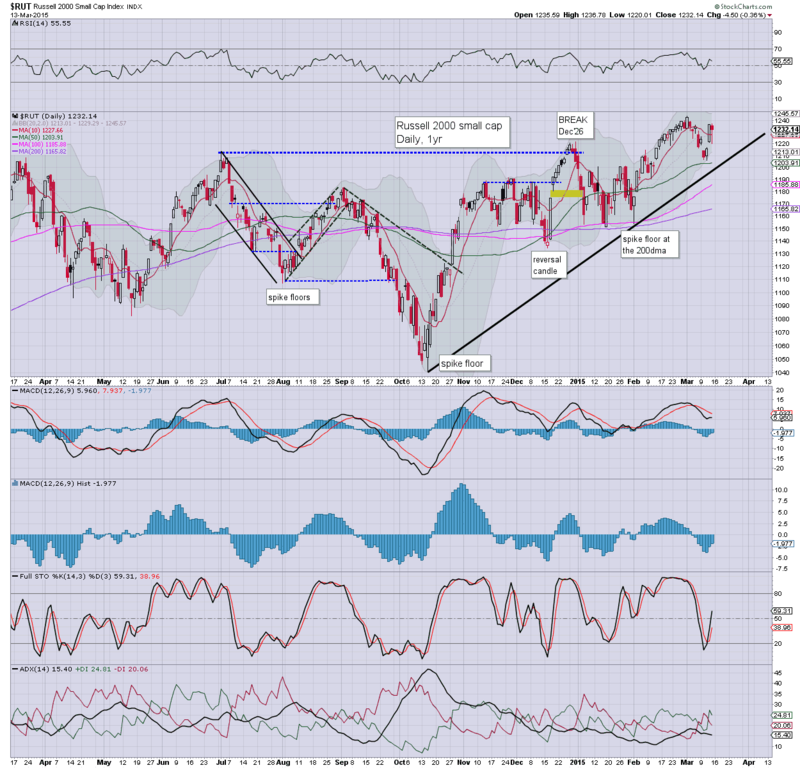 Near term outlook offers a chance of an up wave to 2070.. before renewed downside to at least sp'2010/00 zone. *a red candle to close the week.. confirming last week's (blue) provisional warning of trouble. A pretty extreme net weekly decline of -9.9%. Oil looks set to lose the January low of $43.58, and fall into the 30s. US equities settled moderately lower, sp -12pts @ 2053. The two leaders - Trans/R2K, settled lower by -0.7% and -0.4% respectively. Near term outlook is very mixed, with threat of a move to the sp'2070s, but regardless.. renewed downside to sp'2010/00 zone looks probable. Fascinating day... with a surprising major fail in the market to continue rallying. With the failure of the F flag, and overall weak price action (not least in energy stocks), the next bounce is likely to be just that... a bounce. Market looks set to get stuck around sp'2075 or so.... and then rollover to the 200dma in the 2005/2010 zone.. that should equate to VIX testing the key 20 threshold.